Ignite your taste buds with this flavoursome adventure, enjoy sampling cuisines around the world with your guests. Expand your culinary horizons across the world as our Venue Finder’s take you around the world in 80 private dining rooms starting with European cuisine in London. At Villiers, we provide a free venue finding service from private dining at the world’s most exclusive restaurants, enchanting gala dinners, vast conferences and much more. Making good use of over 70 years’ expertise and knowledge, we are sure to find the ideal venue for every occasion. Find out more on our Venue Finding agency based in London or, enquire today by speaking to a member of our team! Head Chef Anne-Sophie Pic is the only French female chef to hold three-Michelin stars, if you want to taste spectacular French cuisine head to Four Seasons Hotel London at Ten Trinity Square. Anne-Sophie Pic brings her unique, minimalist perspective to food. The sleek private dining room has space for up to 14 guests, the design of the room features dark wooden panels and burnt orange leather chairs. London’s oldest and most celebrated French restaurant and club, L’ Escagot has been one of the most popular restaurants in Soho for almost a century. Traditional, bourgeois French cooking and with a speciality of snails. Ornate private dining rooms perfect for every occasion, Coco Chanel reportedly threw a part here. Some private dining rooms are traditional, others more contemporary, all however are vibrant. In the heart of Knightsbridge, you will find the inviting, Michelin star restaurant Petrus. A modern menu combined with a legendary wine cellar holding over 2,000 different bottles of wine. Enjoy a dinner for eight at the Kitchen Table overlooking the busy kitchen and watch as the genius team create bespoke French dishes in London. An Artist and fashion-conscious haven, Sketch’s private dining rooms are beautiful and quirky located in a central London townhouse. Combining food, art and style, enjoy the amazing creation by Pierre Gagnaire, Choose from the enchanted woodland private dining room for fairy-tale romance or the colourful and fun Gallery. Arguably one of the most beautiful restaurants in London, bedecked in a forest of fake white blossom trees and fairy lights. The private dining room for 23 guests is surrounded by sumptuous wooden panelling, creating a warm and inviting space. Head Chef Marcellin Marc creates inspired French menus to accompany every occasion. For those in the know, 34 Mayfair is the go to restaurant for steak and fish. Located in the heart of Mayfair, a creation by Head Chef Harvey Aycliff and a part of the esteemed Caprice restaurant group. Expect seamless attentive service, a jazz band in the corner, and of course delicious food, whether you’re interested in steaks or not. The artwork 34 Mayfair is designed by celebrated artist Tracey Emin and can seat up to 35 guests on one table. Marcus Wareing’s restaurant at the Berkeley Hotel is one of London’s most acclaimed restaurants with two Michelin stars for their modern British food. There are two private dining rooms, classic and traditional similar in style to Clos Maggiore, the Salon seats up to 16 guests. Or for a unique experience enjoy the chefs table and look onto the kitchen with front row seats to the best show in town. It’s hard to resist being enticed into Corrigan’s not when you’ve seen Richard Corrigan’s menus of culinary classics. The Gentlemen’s club style, the gamey-British food, the service, it all works fluidly at Corrigan’s. There are four options for private dining at Corrigan’s, perhaps the favourite though is the chef’s table which allows you to look onto the kitchen through a glass window, ideal for groups of up to 12. Jason Atherton’s award-winning restaurant with an elegant British menu using the best produce in the British Isles. This Fitzrovia restaurant is covered in cool modern art, which won it the GQ best restaurant interior (2015) but it’s the Michelin star food which attracts its admirers. A modern private dining room featuring a long dark walnut table and rose upholstered chairs, for up to 14 guests. There’s a reason celebrities swarm to this British brasserie in Covent Garden, deserving it a key spot in London’s restaurant scene since 1917 for its classic menu and unfaltering service. Recently redesigned by Martin Brudnizki Design Studio looks out for the contemporary art, stained glass windows and oak panelling. A long thin private dining room is instantly striking, up to 32 guests can be seated on one table. A traditional Scottish restaurant, a mixture of Macdonald tartans, reds and bottle greens. Serving delicious British cuisine with the finest whiskies. The Jacobite room can seat up to 16 people for fun dinners, after the dinner why not step out on to the cigar terrace for another Scottish delicacy? Mac and Wild celebrates the best of Highland hospitality and Scotland’s produce and personalist. A friendly, relaxed approach to Scottish dining with an emphasis of carefully selected meat. Mac and Wild at Devonshire Square has a private dining room, virtual gun room and whisky bar by The Scotch Malt Whisky Society. Mac and Wild’s private dining room will transport you and up to twenty-one guests to a highland lodge enchanting all those who visit. Serving up a unique Belgium dining experience in London, with specialist Belgium food with traditional mussels from the Shetland Islands and 52 different types of Belgium beer to choose from. Belgo Centraal has two semi private vaults to be hired for groups of up to 30 people. Delicious German food served up in a vast converted gym from the 19th Century, redesigned by restaurant moguls D&D London. A semi-private dining room looks down on the buzzing restaurant from a terrace, seating up to 32 guests or 50 guests standing. Inspired by the grand café of Mittel-Europe, the Delaunay is one of the most popular restaurants in London. Not strictly exclusively Austrian cuisine, but they do have a spectacular Viennese Afternoon Tea. The traditional private dining rooms can seat up to 8 guests in one or 14 in the other or can be combined, featuring original paintings from the restaurants collection. Chef Helena Puolakka brings you brilliant dishes from her roots on the south-west coast of Finland. A focus on uncomplicated, distinctive food with French influences. Explore the unique flavours of the Nordic menu in the intimate private dining room seating up to 16 guests, a large wooden table in the centre of the room surrounded by wooden panelled walls. Contemporary Nordic dining and design stemming from Scandinavian nature. Henrik Ritzen menus are particularly focused on seafood and fresh seasonal ingredients. The highly acclaimed design studio of Swedish Martin Brudnizkihas creates a stunning dining space that celebrating Nordic heritage. Experience the best of Nordic culture in the Copenhagen room seating up to 14 guests around one round table. Michelin star cuisine with Icelandic influences, light and refined fine dining. The private dining room is named Tolli after a famous Icelandic artist whose work is displayed. Seating up to 16 guests, you can enjoy a wine tasting prior to your meal. Hearty, beautiful Italian dishes created by the beloved Francesco Mazzei. Called one of the best Italian restaurants in London, which is incredible high praise it seems that restaurant critics don’t have a bad word to say about Mazzei. There a three private dining rooms to choose from, in the smallest you can dine surrounded by delicious Italian wines in the Sommelier’s own wine room which seats up to six guests. The previous home of Francesco Mazzei, with the same love for homely Italian food by with a more contemporary styled restaurant can be found at L’Anima. Simple, and sophisticated with glass walls and white furnishings. You can dine in the midst of the dark wooden racks filled with Italian wine, or in the private dining room incased in smooth white limestone walls, seating up to 16 guests. World-class seasonal cuisine served at this hugely popular Chelsea restaurant named Daphne’s. Making sure you live le Dolce Vita, with genius Italian dishes you and your guests are sure to love. Daphne’s charming private dining room can seat up to 40 guests, and with a retractable roof this space can bring the inside in. Be transported to sunny Spain in moments for sunny and authentic experiences. Executive Chef Nacho Manzano has creates restaurants reminicent of his childhood at his grandmother’s house in the mountains of Asturias in the North of Spain to create a wonderful experience. Iberica in Marylebone can seat up to 42 guests, or the Victoria restaurants for up to 7 guests. Charcuterie and tapas bar called Dehisa, named after the backfooted Iberico pigs from a woodland area in Spain. Dehesa uses a fusion of Spanish and Italian sharing dishes served with award-winning wines from up and coming vineyards. The Dehesa private dining room is ideal for groups of up to 13 guests, seated round a tick oak table with a retro glass chandelier. Barrafina is modelled on the popular tapas bar Cal Pep in Barcelona, a trendy restaurant with an open, simple, sleek space. An eye-catching marble countertop curves around the restaurant, lined with red leather stools, usually filled with eager dinner guests excited for the next sybaritic creation to appear. Enjoy the sensational indulgent dishes from your own private dining room with an open kitchen so as not to miss the buzz of the Barafina kitchen, for groups from 12 to 32 guests. The genius of chef Jason Atherton cannot be overstated, the Social Wine and Tapas restaurant is widely praised. A dynamic fine wine list combined with gourmet tapas. The restaurant is low lit, and industrial chic located in Marylebone. There are two semi private dining spaces, the tasting rooms seats up to 8 guests and is perfect for an informal wine tasting. Or there is a private dining room for 10 guests, with warm burnt orange walls and thick velvet curtains. Bringing authentic Portuguese food to London with menus created back over generations, spectacular Portuguese wines, custard tarts and even the traditional blue tiles. 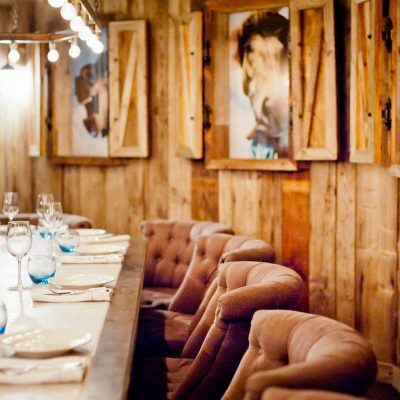 The rustic private dining room seats up to 12 guests on one table, with Portuguese wines and crates also in the room. London’s original greek restaurant Elysee was established in 1937, at Elysee it’s a celebration every night with live music and entertainment. Light earthy tones of browns and creams and hints of fold leaf, it’s tradition Greek food that will transport you away to the Greek shores. A light Georgian private dining room centres around a smashed plate chandlier seating up 20 guests, prior to dinner enjoy drinks in the private roof garden. Welcome to Turkey, or at least welcome to this authentic Anatolian Turkish restaurant in the City. Delicious, healthy Turkish cuisine served to the highest quality, many of the dishes are served in a traditional clay oven. The private dining room seats up to 8 guests in an intimate, warm space. Kazan is a smart and traditional restaurant in Victoria, the menu is filled with delectable ottoman-inspired dishes each with their own modern twist. The private dining room can be found in the form of the Ottoman Lounge, seating up to 40 people, why not indulge in the Ottoman Feast with your esteemed guests? Quaglino’s, surely in your history dating back to 1929 someone has written a love letter about you. The charm of a French brasserie, hints of Italian cuisine but with the finesse of one of London’s most adored dining options. Two private dining rooms to choose from each as art deco and bold as the rest of the restaurant, the Giovanni room can seat 14, the Prince of Wales room can seat 40. The only way is up with Duck and Waffles mesmerising private dining room. A playful menu by Chef Dan Doherty incorporating British cuisine with European influences, and their famed duck and waffle dish. Open from sunrise to sunset, means you can catch that breath-taking view over London at any part of the day. For the highest private dining room in the country head to Duck and Waffle, seating up to 18 guests. The very trendy Riding House Café is described by the owners as a ‘modern, all-day brasserie’ it’s a fantastic interior of bold colours with vintage features. A varied, upmarket menu ensures there something for everyone, and if you want to try a range there are many mini plates to experience. The Stables private dining room is similar to a country escape, with wooden walls and doors the reveal pictures of horses, its unique and cool and seats up to 14 people. If 1 Lombard Street is one thing, it is grand, set within the neo-classical former bank the Square Mile. A doomed skylight above the circular bar is undoubtedly eye catching. And the food is just as spectacular. Chef Juri Ravagali creates modern-European dishes with influences from around the world. The beautiful Botanical Room filled with florals lit by natural daylight, seating up to 40 guests. Gordon Ramsay’s Heddon Street Kitchen is a go to option for those looking for simple European cuisine. And with a total of six Michelin stars, you know you’re in for a treat with Gordon Ramsay restaurants. Moments away from Piccadilly Circus, Heddon Street Kitchen is the perfect place to unwind with some first-class food. It’s an intimate private dining room for 12 guests, around a large marble table ideal for meetings as well as dinners. Enquire with our complimentary venue finding service today!